Something I have always admired about art is that it can take its shape in many forms; making it easy to find in objects that aren’t actually meant to be art! 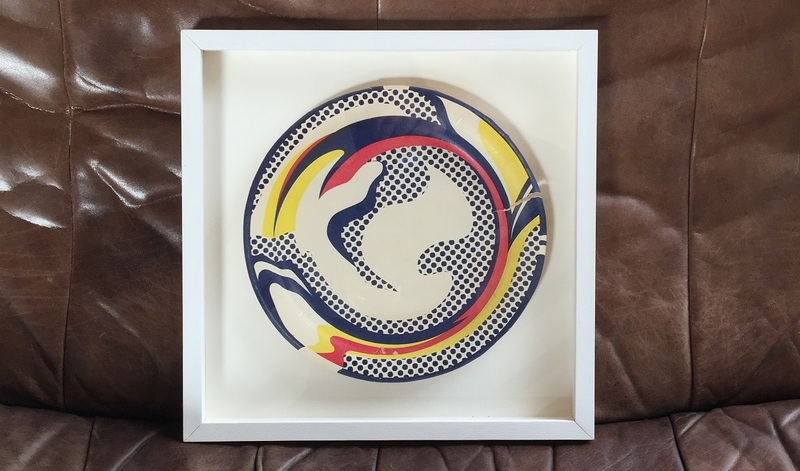 An example of this is the Roy Lichtenstein plate I bought on eBay a few years ago. Plainly speaking, it is a paper plate, but from humble beginnings it has become a very recognisable piece of Roy Lichtenstein art. Lichtenstein was a leading figure in the Pop art movement in the 1960’s. Back in 1969, he designed the paper plate for Marilyn Monroe photographer Bert Stern who had set up a New York Boutique, “On First Store”. Unfortunately, the shop didn’t last long and most of the plates were left undistributed. They are now a highly sought-after collectible and feature in many major art collections including Tate Modern. Lichtenstein inadvertently transformed this everyday mass-produced paper object into high art. Who would have thought a paper plate could make the most stunning piece of wall art – although it is probably the most expensive throwaway tableware you can get your hands on!